I was raving, back in September, about “The King’s Speech,” which I saw at the Toronto International Film Festival and which immediately became one of my favorite films of the year. (Its Seattle opening date keeps shifting around; formerly on Thanksgiving, it now looks to be coming here for Christmas.) 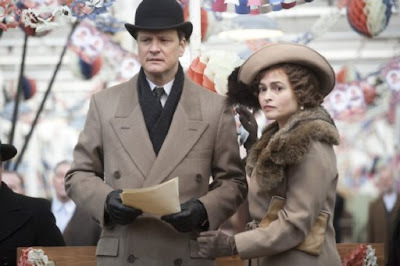 The true story of how England’s King George VI overcame a devastating speech impediment, it’s a wonderfully acted (by Colin Firth as the king, Geoffrey Rush as his speech therapist, and Helena Bonham Carter as his wife, the future Queen Mum) slice of history. But the ever-clueless members of the MPAA ratings board are concerned about teenagers seeing this film — because of one scene in which the king, in the course of his treatment, lets fly a string of swear words. Because, of course, no teenager has ever heard the F-word. And because that would, apparently, be far more upsetting to a young person than, say, the kind of explicit violence seen in movies like “Salt,” “Casino Royale,” and “Taken” — to name three movies recently granted the rating of PG-13. It’s fine, says the MPAA, to let kids watch people get shot in the head and killed, as long as nobody’s swearing. An MPAA spokesperson told the L.A. Times that the board is merely being consistent: “We’ve made clear what our language guidelines are, and it’s not fair, in fact it would look arbitrary, if we threw it out for just one film.” But Goldstein points out that the guidelines are, indeed, arbitrary: More than one use of the F-word, for example, earns an automatic R, but there’s no rule about how many, say, gunshots or gallons of blood quality for a PG-13 or an R.
It’s true that I can’t imagine that teenagers will be storming the multiplexes wanting to see “The King’s Speech” — but those interested in English history, or those who like Colin Firth, or perhaps those seeking inspiration from someone who publicly overcame a speech impediment will have to sneak in. And then, apparently, seek therapy to recover from the shock of hearing a grownup swear. Sigh. Just another day at the MPAA.